Good morning. It's a cold bright windy day out there and I spotted the first few snowdrops in a neighbour's garden this morning - a welcome reminder of Winter's progress. At the start of each year, D works on a 2 month project for the BBC which involves very early starts and late nights so unless he is working from his home office the kids don't see him at all on workdays, and he doesn't see daylight. Getting to the end of the month means we get him back ... until the next project. They love having him around especially because Daddy is all about the tickling, jumping around, dancing to rock music and piling on top of each other - they don't get much of that with me. Of course it also means the days are getting longer - it was LIGHT when I got out of bed this morning - the first time this year. Poor light is becoming tedious - roll on Spring. I don't feel I've done much knitting, but compared with last week I can see I've made lots of progress and am hoping to finish my Hitchhiker tomorrow as it's almost time to start decreasing. I've also been making more hair for Pixie Moon - it's surprisingly time-consuming but completely worth it. Just a bit more to go and she'll be done. I'm still reading last week's book - Look at Me by Jennifer Egan - after getting just over half way I've stalled and am not sure if it's the story or just having less time to read now that I'm up and about. Either way, I haven't read much yet have still managed to purchase a few new books in the Kindle Daily Deals so I do need to get on with it so I can read those! 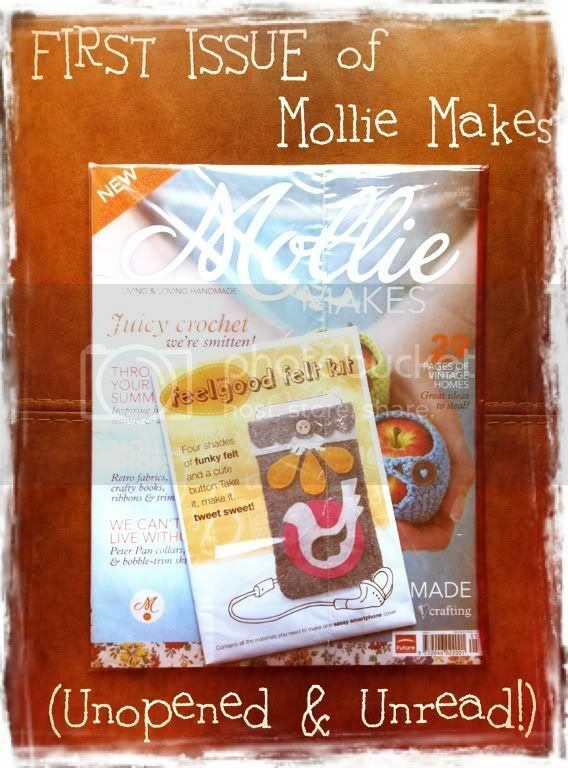 If you missed yesterday's post, and would like to get your hands on a rare unopened copy of Mollie Makes first issue, you can find details of how to enter here. I'm happy to post anywhere so all you lovely international readers can enter too. As usual I'm linking in with Tami and Ginny today, where there are lots of other yarny and bookish posts. ooh - I LOVE your Hitchhiker! I hadn't given the pattern a second glance before, because the colours on the main rav page do nothing for me - yours is yummy though! The Hitchhiker is progressing nicely. That yarn works really well. The Hitchhiker is soo beautiful!! Your Hitchhiker looks so great and you have me wanting to cast one on! Have a happy yarn along! 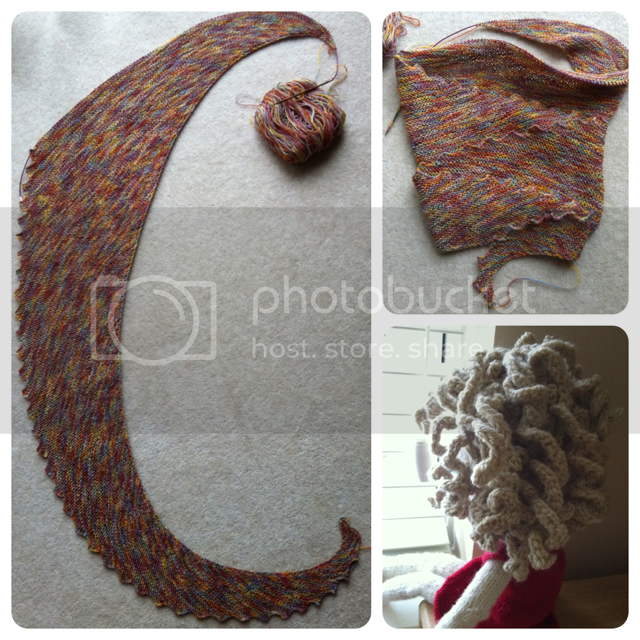 Love the Rustic Rainbow wool you've used for the Hitchhiker. Gosh I just love Pixie Moon's hair - totally worth the effort! Hitchhiker's also looking great! Pixie Moon has fantastic hair! it must take so much work. Your hitchhiker is beautiful, bet you are itching to wear it, I would be! Your hitchhiker is gorgeous. And your Pixie Moon is so adorable, what a lot of work, love her. The hair on Pixie Moon is soooo cute! I love it. 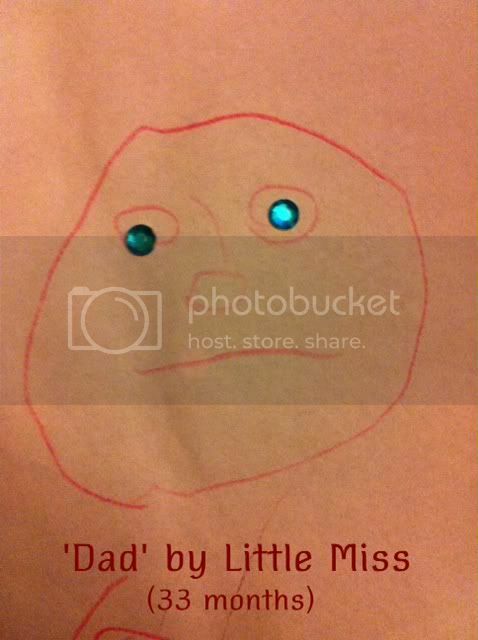 As for the long husband hours, I totally get that right now too. My husband is an assistant college basketball coach in addition to his "real" job, so we don't see him much right now. I'm craving April when we'll get him back again. I'm good with being supportive for most of the season, but at this point I'm done. Arggghhh. Ooh, very pretty shawl. Sometimes variegated yarns work up funny, but your yarn looks beautiful in that pattern. I LOVE Pixie's hair. I want woolen hair like that. Wouldnt it be fun??? That scarf is really fun . It's progressing well. And oh, your Hitchhiker---I adore that pattern, and it looks so lovely in that yarn you've chosen. I hope to see it again on Friday. The hair for Pixie Moon looks awesome! The doll is looking incredible and the shawl too. It is starting to be light when I leave the office now. It's so uplifting to think the days will soon be long enough to actually take photos of things when I get home! Can't wait to see Pixie Moon again in all her full head of hair glory.